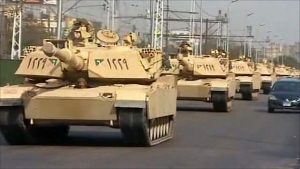 The Egyptian army has appeared in US-based military analysis Global Fire Power’s 2017 review of 133 world armies as the top army in the Arab world and the 10th on the world ranking, dominated by the United States and its rival Russia, holding respectively the first and second ranks. The Egyptian army according to Global Fire Power (GFP) stands out as the 10th army among the 133 countries listed in the ranking because of military capability ranging from number of active forces to fit-for-service personnel. It also exhibits qualitative equipment whether in its airpower or navy – giving it an edge over armies in the region, even ahead of Israel (15th). With a total 1,329,250 military personnel, including 454,000 active forces, the Egyptian army also has one of the best airpowers in the world given recent arm deals with foreign countries including Russia and France. The Egyptian airpower, GFP notes, possesses fixed-wing warships representing attack aircrafts “as well as dedicated forms and light strike types”. It also displays over 200 helicopters also called rotary-wing equipment. The navy is well fitted with state-of-the-art equipment and technology, GFP notes, adding that Egypt has 2 aircraft carriers, 5 submarines, and 9 frigates. The Egyptian army is also by far the strongest in the Arab world beating Saudi Arabia (24th) and Algeria (25th). Despite its strong army, Egypt is wrestling with militancy in the Sinai Peninsula. Islamist groups aligned with the Islamic State group (IS) are avenging removal of Islamist President Mohamed Morsi in 2013 by current President al-Sisi who was then minister of defense. Fighting with militants has spilled to urban areas including to capital Cairo and other major cities. The interior ministry Monday said security forces killed six “terrorists” affiliated with the Daesh militant group during a raid on an abandoned apartment building in Upper Egypt’s Assiut governorate, in Dayrot town. Authorities said it was a preventive raid. In contradition to such rankings, dozens of security forces of the Egyptian army were killed last Friday in coordinated attacks in the Sinai. IS claimed responsibility for the attacks. The army claimed killing 14 IS militants in retaliation on Saturday near Ismailia governorate. Posted by KanelkaTagba on Jul 11 2017. Filed under Headlines, World News. You can follow any responses to this entry through the RSS 2.0. Both comments and pings are currently closed.